Freeform has shared some photos of the cast and producers of Shadowhunters at the Television Critics Association winter press tour on Saturday, where they presented the show and answered questions with television critics. The photos feature the cast and showrunner Ed Decter and executive producer McG during the show’s panel, as well as shots of the cast on the Freeform red carpet. TCA WINTER PRESS TOUR 2016 – “Shadowhunters” – The cast and executive producers of “Shadowhunters” at Disney | ABC Television Group’s Winter Press Tour 2016. 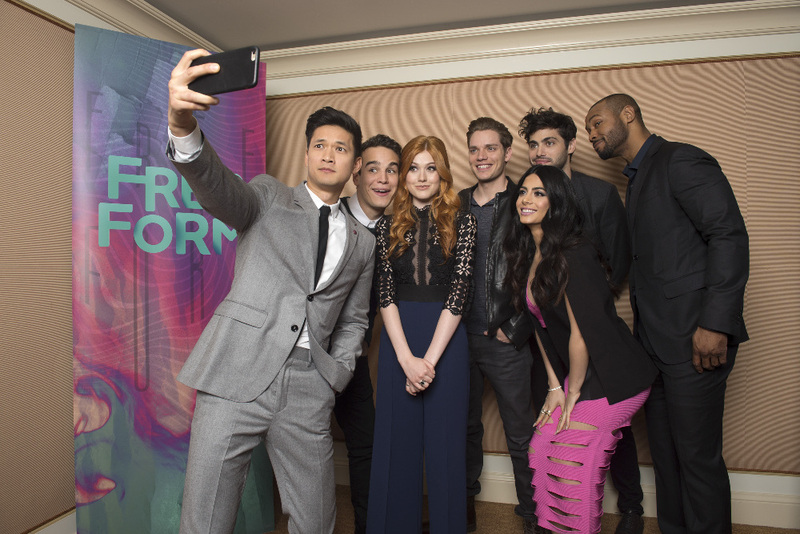 (Freeform/Image Group LA) HARRY SHUM JR.
TCA WINTER PRESS TOUR 2016 – The cast and executive producers of Freeform series graced the carpet at Disney | ABC Television Group’s Winter Press Tour 2016. (Freeform/Image Group LA) HARRY SHUM JR.
Shadowhunters premieres Tuesday at 9/8c on Freeform. Weird outfits…just, weird. Even weirder people.